The sad news has just reached the Club office that Sir John Whitmore passed away last Friday 28 April at the age of 79. He had recently suffered a severe stroke. Although he inherited the baronetcy on his father’s death in 1962, and came to be known popularly as The Racing Baronet, John was completely unpretentious and preferred to be known simply as ‘John’. He was without doubt one of the outstanding British touring car drivers in the first half of the 1960s and is probably best recalled as the winner of the 1961 British Saloon Car Championship in a 848 cc Morris Mini-Minor which he had bought for £400. However, he had already begun to make a name for himself in GT racing in 1959 with one of the first Lotus Elites which he had been able to acquire after Team Lotus Formula 1 driver, and close friend, Alan Stacey had convinced Colin Chapman that John would do the car justice. After winning his first race with the Elite at Snetterton, John qualified fourth, and therefore on the front row of the grid, at the Daily Express International Trophy meeting, alongside Colin who there and then offered him a drive in an Elite at Le Mans in a month’s time as team mate to a Scottish farmer by the name of Jimmy Clark. John, who was a cereal farmerd in Essex, and Jimmy brought the Elite home 10th overall and second in class and remained firm friends until Jimmy’s death in 1968. 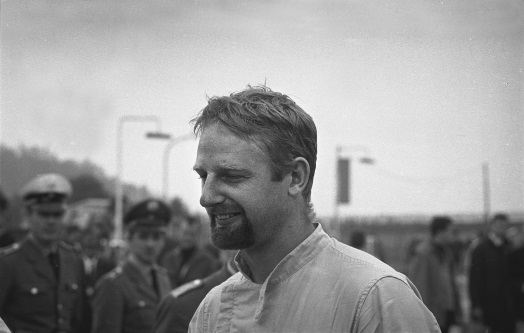 John Ogier, an Essex poultry farmer, asked John to drive a variety of cars for his Essex Racing Team ranging from a Formula 2 Cooper-Climax T51 to an Aston Martin DB4GT Zagato and a Tojeiro-Jaguar; he deputised for Jimmy Clark in the Border Reivers Lister-Jaguar and won at Charterhall; and drove in Formula Junior in 1960 for the Fitzwilliam team of Lola Mk 2s and in 1961 with a Lotus Type 20 with the less popular BMC engine, albeit the best there was since it was looked after by Cambridge wizard Don Moore who also took care of the Mini-Minor. Also at this time John enjoyed considerable success in jazz legend Chris Barber’s Lotus Elite which was duly replaced by an early Elan which seemed to either win or shed a wheel. The 1961 championship success brought an invitation to drive a works-supported, Ken Tyrrell-run Mini-Cooper and then Cooper S through 1962 and 1963, in the latter year John finishing a class-winning second in the BSCC to another East Anglian farmer, Jack Sears, and his various Willment Fords. Ford then came calling and for the rest of his career John performed prodigiously for the Blue Oval in Lotus-Cortinas, Ford Falcon and Mustang, Shelby Cobras and GT40s. He won the 1600 cc Division of the European Touring Car Championship with an Alan Mann-prepared Lotus Cortina in 1964 and the following year was a major contributor to the Shelby Cobras defeating Ferrari in the FIA GT Manufacturers’ World Championship. In the two-part Tourist Trophy round of the Championship at Oulton Park John drove one of his greatest races, battling against a broken exhaust which was both deafening and causing him to be poisoned by fumes. In 1966 in GT40s John was second in the Monza 1000 Ks with Masten Gregory and second in a 7-litre Mk 2 at Spa Francorchamps with Frank Gardner. On the only occasion he raced one of Alan Mann’s Falcons, John was the first driver to lap the Silverstone Grand Prix circuit at over 100 mph in a touring car. At the end of 1966, influenced not a little by serious accidents, some fatal, to some of his friends, John retired from racing and pursued various other interests including flying. He lived for a time in an alternative community in New York State before setting up an executive training firm, Performance Consultants. He never completely turned his back on motor racing and in 1990 was persuaded to have three outings in an 8.1-litre McLaren-Chevrolet M8F. After finishing third first time out at Montlhery, he was second at Donington Park and then at the Silverstone Historic Festival won his second race of the weekend after passing the similar car of Charlie Agg round the outside of Stowe Corner in a true moment of self-belief. This really was John’s last race and a magnificent way to sign off on his racing career. In later years John always kept in touch with friends from his racing days and the BRDC, of which he was a Life Member having first been elected in 1962 and serving as a General Committee member from 1965 to 1967. He was a fascinating raconteur who, without any self-aggrandisement, could regale an audience of one or 101 with wonderful stories of racing as it was in the 1960s. The BRDC extends its sincerest condolences to John’s family, in particular his daughter Tina and son Jason. The funeral will be private but it is intended that there should be a Memorial event later in the year.